The home at 1108 Tucker Street in McKinney, Texas has stood unaltered during most of its history. The only major alteration occurred within a decade of the original construction of the house. The house originally had a sleeping porch on the southeast corner of the house. This was turned into an interior room perhaps to accommodate the needs of the first owner’s growing extended family. In 2002, the interior was modified with the addition of a bathroom and the enlargement of the kitchen in the rear of the house. An original outbuilding with a dirt floor that was used as a garage was torn down around the same time. Isaac arrived in McKinney, Texas in 1857 from Virginia via Missouri and built a Colonial style mansion outside of town. Built from pine hauled from Jefferson, Texas. He was a Confederate soldier, a farmer, and the younger brother of Albert Gallatin Graves. Albert Gallatin Graves was born in Orange Co. Virginia in 1813 but lived in Missouri be- fore arriving in McKinney with his younger brother Isaac in 1857. Like his brother, he farmed west of town. He married Frances J. Harrison (also from Orange Co., VA) and had seven daughters and three sons, including James “Wick” Graves. It has been claimed that his wife Frances was a first cousin to President William Henry Harrison (1773-1841). However, her family and the ninth President have no connection. Church and of the I.O.O.F. fraternity. He served as alderman for several years. His sister, Mary Quintillia Graves, married “Tuck” Hill, a cousin of Jesse and Frank James. He resided at 1207 W. Tucker at the time of his death. 1925, Jesse built the house that now stands. Later, Jesse went to work for Collin Co. Farmers Mutual Insurance located in the Wilson Building at 113-1/2 E. Virginia. 1889-1 893. 1899-1 903. He lived at 404 W. Tucker Street at his death. George was born to Samuel and Sallie (Barnes) Fox in 1867. He was an influential busi- ness man and civic leader. 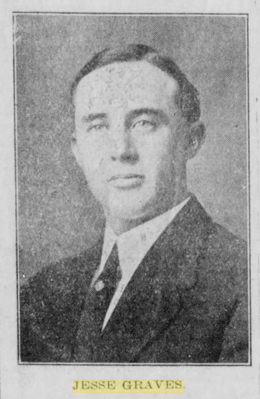 He and his first wife Lula (Lillard) Fox built the home at 311 N. College in 191 5.The McKinney Courier-Gazette claimed George Fox “served his day and generation. He was justly regarded as one of the most successful, safe, conserva- tive business men of our city or county.” He opened up the Fox Addition and did consid- erable building there. He was the Director of the Collin County National Bank. His building company is likely to have built the house at 1108 Tucker St. for his nephew Jesse Graves. At the time of his death, George resided with his second wife Ann (Tay- lor) Fox at 301 N. College. Francis Marion “Tuck” Hill served in the Confederacy in Gordon’s Regiment under General Price as a captain. He later served under the infamous Civil War guerrilla fighter Charles W. Quantrell and took part in the Lawrence, Kansas raid as well as the battles at Centralia & Fayette. He was badly wounded at the Albany battle trying to retrieve the body of Captain Bill Anderson. He was one Of the last soldiers to surrendered at Lexington, Missouri after the war. He settled in North Texas where he became a well-known mule trader and served as a McKinney Alderman. He was the second cousin to Jesse and Frank James who made occasional visits to his home at 616 W. Virginia. November 14, 2002 Jeffrey and Angela Gustafson Scott Rogers,Jr. The tenant history mirrors the ownership history except for the period when V.E. Justice rented the house from J.D. Hayes from 1978 to 1980. In 1920, Mckinney, Texas was coming into its own. The census from that year shows 6,677 residents, a 40% increase from the decade before. City Hall was newly built and the Lions Club was established that year. The agricultural community of the last century was giving rise to a new urban center. Sons and daughters of the first wave of immigrants to the area were benefiting from the new social and financial opportunities available to them. One of these beneficiaries was George W. Fox. Born in 1867, George would go on to become “one of the most successful, safe, conservative business men of our county.” He held numerous civic posi- tions and was at one time the Director of the Collin County National Bank. He was instrumental in opening up the “Fox Addition,” an eleven-block residential development northwest of the downtown. In 1922, just two years before George’s untimely death, he sold a lot (Fox G W, BIk 2, Lot2a) from his subdivision to one of his nephews, Jesse G. Graves, who needed to build a house for his wife Mary Ann and his (at the time) two young children. Unfortunately, George died before Jesse could finish his new house at 1108 Tucker Street. The portion of Tucker Street closer to town was known as “Banker’s Row” because of the large two-story homes and the professions of their owners. 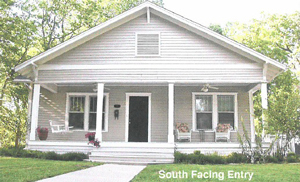 Although the portion of Tucker Street only six blocks away was more “suburban,” the existence of Jesse’s one- story, Bungalow-style house is evidence that George was helping out a relative in need. In fact, George was helping out other relatives as well. Jesse’s older brother, Charles W. Graves, built a house in George’s subdivision at 1207 Tucker. George’s dad, Samuel H. Fox, moved from his farm west of town to reside at 808 Tucker. Jesse Graves was born in 1887 and graduated from McKinney High School where he excelled at football. After his graduation in 1905, he worked as a bookkeeper at Kistler & Bristol. Later, he married Mary Ann Duffy and in 1912 they had their first of three children. By the 1930’s, he was working at Collin County Farmers Mutual Insurance Co. located in the Wilson Building at 113% E. Virginia. Jesse did what many immigrant children did -he became urbanized. Growing up on a farm gave Jesse experiences with mules, plows, and building barns so it is safe to say he probably did not know about Gustav Stickley or the American Arts and Crafts movement or about other Architectural styles in vogue in New England or California. Instead, when Jesse Graves wanted to build a house, he simply built one that he could afford using materials and techniques that were in use at the time. The most dominant architectural feature of Jesse’s house is the broad porch that stretches the entire width of the south-facing house. Above the porch is a gabled roof that creates a protective pediment that provides shade in summer, but sun in winter. This “solar” feature would have provided Jesse’s family much comfort despite the Texas weather. The broad pediment sits atop four straight, square columns and is interrupted by an 8 inch wide “frieze course.” In the middle of the gable pediment is an attic vent, an adornment of a practical mind that lets you know the house is about function. This one-story pier-and-beam structure’s most significant ornamentations are the curved wooden brackets that support the exposed rafters that brace the overhanging eaves. Double-hung windows are generously applied to every side of the house. The four vertical rectangle panes above a single moveable sash gives the house its strongest suggestion of style. Jesse’s house was not intended to mimic the “modern” style of the time. As common in regional architecture, the purpose of a home is to shelter a family while expressing a positive message about its residents to the community. The architecture of the Jesse Graves home borrows vocabulary from the American Craftsmans Bungalow style with its broad porch, exposed rafters, and divided-light windows. However, the proportions, columns, and rake of the pediment borrow vocabulary from the Greek Revival style. The builder was using whatever architectural ideas he knew of to make the house look grand and fashionable, but most of all, affordable. The Graves were a close-knit family and after the death of Jesse’s mother Fannie (Fox) Graves in 1927, it became more so. That’s when 11 08 Tucker housed perhaps its most notable and colorful resident -James Wickliffe “Wick Graves. Wick Graves was among the first settlers in the area arriving in 1858 at the age of 10 with his father, Albert G. Graves. Albert settled his family west of town. About a year later Albert’s brother, Isaac Finch Graves, came to settle nearby. Wick enlisted in the Confederacy and served as a Private in the Texas Spy Co. CSA under Capt. Alfred “Alf” Johnson. Captain Johnson’s company was active in conducting reconnaissance and small unit actions in northeast Texas and Arkansas. Following the war, Wick returned to McKinney and in 1877 married Fannie Fox whose father, Samuel H. Fox, served as a County Commissioner for several years, a job Wick himself would have in 1911 and 1912. Wick was actively involved in community life. He was a member and a deacon of the First Christian Church and the Independent Order of Odd Fellows (IOOF). He was one of the survivors of the collapse of the Mississippi Store building in 1913. He escaped unharmed yet his wife and granddaughter suffered serious injuries. After his wife’s death in 1927, he lived for a time with his son Jesse at 1108 Tucker St.
No doubt Wick “mingled” with another colorful McKinney resident, his brother-in-law Frances Marion “Tuck Hill, a man with a storied past and a hero among people of McKinney. Everyone in McKinney knew Frances as Tuck. He was a popular mule trader who was well-known beyond his hometown. The event of this death in 1920 made for a 15-columninch front-page story in the Courier-Gazette with a four-line headline. Tuck was adventurous. By the age of 17 he had traveled as far away as Salt Lake City. At the age of 20, he joined the Confederacy and quickly rose to the ranks of Captain and eventually took up with the famous “Quantrell’s Guerrilas,” who were known for their ruthlessness against their enemies. It is no coincidence that this is the same com- pany of which the infamous brothers Jesse and Frank James were members. Jesse and Frank were cousins of Tuck. Jesse and Frank’s grandmother and Tuck’s grandfather were siblings. Jesse and Frank may have come to town in 1866 when cousin Tuck married Mary Quintillia Graves (age 22), the sister of his fellow Confederate Wick Graves. To the Graves, this union meant that Jesse and Frank James were not just wild-west legends, they were family. Though Jesse James died before Wick’s son Jesse G. Graves was born, “cousin” Frank lived in the McKinney area until his death in 191 5. There would have been ample opportunity for Jesse G. Graves to interact with his “uncle” Frank. No doubt when Wick came to live with Jesse at 1108 Tucker Street, there would have been conversations about their famous relations. Jesse and Mary Graves lived at 11 08 Tucker Street for 20 years. In 1945 they sold the house to Orlena “Polly” Smithson and moved to 910 W. Hunt Street. A year later Orlena married her new husband, Harry E. Waters. Harry was a veteran of WWI and WWII and was stationed at Pearl Harbor when the Japanese attacked on December 7,1941. He worked as an advertising manager for Perkins & Wilson (publishers of the Daily Courier- Gazette), a position that kept him well-connected among the business community. Harry and Orlena sold the house in 1952 to Verbie Hayes and his wife, Ruth. Verbie was a rural mail carrier and Ruth worked as a service representative for Southwestern Bell. They lived in the house for a short time until renting it in 1953 to V.E. Justice. Mr. Justice, as yet, is the home’s longest resident having lived in the house even longer than the original owners Jesse and Mary Graves. Nothing says historic like a sign reading “Jesse James Slept Here.” Though the illustri- ous bank-robber never saw the house, people who were close to him called it their home. Some of McKinney’s most important pioneers would have made visits to the house to see their children, grandchildren, and friends sitting on its ample porch be- neath the broad pediment. The architecture of the house is a fine example of a regional style that mixes and re-in- terprets the predominate styles of the time to reflect the owner’s taste, experiences, and resources. The resulting structure is as Texan as chili without beans.